I am not a first time visitor in the Ilocos Region, but this is certainly the first time I sat foot here with my family. I came in late for this trip as I had work, but the delay gave me enough time to prepare and research for new things to do in Ilocos. 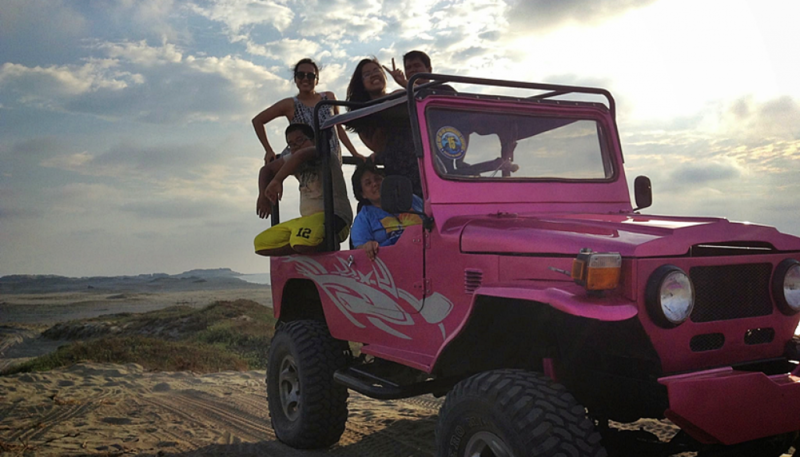 I came upon blogs telltailing the extreme adventures that La Paz Sand Dunes in Laoag offers. I first wanted to visit this place because I wanted to have a feel of a real-life desert. I long dismissed the possibility of working in the Middle East so I have a very slim chance of seeing long vast of sand. At first, we had a bit of difficulty locating Ilocos Sand Dunes because my offline map could not find it and our driver has no idea of the location. Luckily, on our way from the Bangui Wind Mills to the Paoay Church, we came upon signage after signage offering Sand Adventures packages along Laoag-Paoay Road. The sand area could not be seen from the road actually, so I was not very convinced at first. After eating a late and delicious lunch at Herencia de Paoay, we retraced the road to the said signages. The 4×4 Ride and Sandboarding package was priced at Php 2,500. I tried to bargain but they wouldn’t bulge. It was a peak season as we came during the Holy Week, but not a lot of people were there to try it. I would never have imagined to have my 52 year-old mother join any “extreme” adventure, and so I was surprised that she hopped on with us. My youngest brother, 13, was also part of the adventure, just to prove it was safe. At first, I thought I was the one who will drive the 4×4 vehicle but upon seeing the terrain, I am glad Kuya Dany was with us. It was a series of body bumping, pore-clogging, and hair-drying ride that had left us sunburned. But it was so fun! In every sharp turn, sloppy hill, and great dips, the trick is just to grab the metal railing real tight and shift one’s body weight opposite the descending side. There are a lot of photo opportunities that the guides and drivers voluntarily offer. And I must say they take quite amazing photos. Upon reaching the the Sandboarding area, we alighted the 4×4 vehicle and stepped on the boards which are very similar to surfboards, skimboards, etc. Since I have already tried surfing, I sandboarded while standing up while my two siblings opted to sit in the board which is easier. Actually, whatever technique one use, it’s both difficult, dirty, and fun! After 2-3 turns on the board, we rode our vehicle again and continued to trail back the bumpy roads. Kuya Dany, the driver, gave us the chance to wash our sandy limbs in the nearby shore, which by the way has the best view of sunset. We were lucky to have reached La Paz by late afternoon as it is not very hot that time as compared if we did our sand adventures in broad daylight. I could have sworn to have experienced real-life dessert if that was the case. After the one hour ride, my sister unfortunately forgot her jacket in the nipa hut near the sandboarding area, and Kuya Dany helpfully retrieved it even though it was quite far. There is also a clean and well-maintained restroom and shower room in front of Onse Reef registration area. Not wanting to enter our van drenched in sweat and sand, we took a shower and paid only Php15. Great one-stop-shop service!